Description: CSX SD70MAC leadig a SB train though the yard at Manchester. CSX SD70MAC 702 has since been renumbered to the 4500 series. Description: CSX 702 faces CSX 439 in an EMD vs GE stance at Florence, S.C. 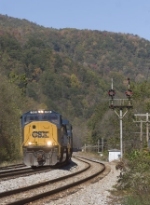 Title: CSX 702 leading E725 At St. Denis Md. Description: Milepost 724 is visible. Description: CSX S637 heads southbound through town. Description: Q301 SB trash & mixed freight, Camp Meeting Avenue, 1540 hours. Title: CSX 5001 "Diversity in Motion"
Title: WOW!! What a Lightning Bolt!! Description: North bound manifest Q618 rumbles through Hull Ga. with a pair of SD70ACs just before they were renumbered into the 4500 series. Description: CSX Q388-26 is on Q358's rear. Q388 showed up less than 10 minutes after Q358, giving Q388 a yellow signal. Description: This is the first time I've seen one of the first generation SD70's in YN3.